Sugar is a sly creature – it turns up in the most unexpected places! So if you are trying to avoid eating excess amounts then prepare yourself for some serious label reading. Some food products have sugars tucked away under names that are not always familiar. Others are items are savoury and so very often it just would not occur to you to even check the label. Remember that ingredients are listed on labels by quantity, from highest to lowest, so if sugar is near the top, it could be one of the main constituents of the food. 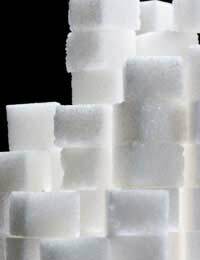 Food experts currently suggest that a high level of sugar means there’s more than 15g of it per 100g of the product. Some products in the UK now have traffic light labelling to flag up these high levels – so look for red circles on the packet or box. But not all manufacturers follow this system so do check the ingredients list yourself too. When you do this, don't just look for the word “sugar,” you also need to search for ingredients ending in “ose.” This is a term that’s used as a suffix for sugars – so fructose, lactose, sucrose and glucose etc are all actually forms of sugar. So while the word “sugar” might not actually be listed with the ingredients, it does not mean it isn’t in there. Watch out for the breakfast cereals. We all know that some products are coated in extra sugar but a vast number of those that appear at a glance to be “unsweetened” in fact contain sugar too. Muesli, for example, seems healthy as do crunchy oat cereals but unless you buy a “sugar free” variety you could find yourself tucking into at least a dessert spoonful of added sugar per bowl. Other breakfast cereals have sugar lurking where you least expect it too. We all know that frosted and honey coated flakes have high levels of sugar in them – but few of us are aware that plain cornflakes also contain sugar. The same can be said for bran flakes, which also appear to be a healthy option. Sugar levels do vary between brands, and no frill and own brand varieties are sometimes surprisingly, the best, but you have to check the box each time you buy a new product. What could be healthier than fruit juice? We all know that juices contain natural sugar but surely if it looks like a juice rather than a squash then it must be free from added sugar? Wrong. There are lots of drinks out there masquerading as healthy juices when in fact they have spoonfuls of hidden sugar added to sweeten them up. Here you should not even need to look at the label to give you a clue – look at what the product is called. If it is just “juice” (ie “Orange Juice”) then it should be 100 percent pure. If, however, the word “drink” appears in the product name, then read the label. An “Orange Juice Drink” or “Orange Drink” is likely to contain sugar and other additives. If it doesn’t taste sweet then it won’t have sugar in it, will it? Wrong again. Sugar is often hidden in products to balance the flavour and can be tucked away where you least expect it. Take sliced bread, for example, many whites list it with their ingredients – and some wholemeals too. Many crackers, breadsticks and cheese biscuits have it in too. Look out for those savoury snacks too. You may buy your child a packet of crisps instead of sweets thinking they are sugar-free but check the label before you do. Some, especially those that have strong artificial flavours, will include sugar on the ingredients list. When you combine this with the levels of fat and salt they also contain, crisps suddenly cease to be such a great snack option. All sorts of ready meals contain sugar too. Look out for frozen or chilled Chinese, chilli or curry dishes, for example. Italian-style food can be just as bad too if bought ready-made. Check the labels on ready made pasta sauces in bottles, tins or packets and even everyone’s favourite, the pizza, can hide sugar inside. Once you have found a sugar free main dish, think about your accompaniment too. Salads, for example, might seem like a good idea but if you are buying them ready-made or packaged, then check first. Believe it or not, hidden sugar can lurk in coleslaw, dressings and even sometimes in fresh boxed salads.